The journey from “I’d like” to “I am” begins with the desire to change but only ends successfully with the will to see it through. I’d like to get up earlier in the morning. I’d like to get fit. I’d like to lose that extra 15-50+ I’ve got on. I’d like to get a new job. I’d like to get promoted. I’d like to travel more. I’d like to have more money. I’d like to be happy. In fact, these are all great things we’d all like! It comes down to ..
One of my favorite movies that best illustrates the pursuit of change is the Pursuit of Happyness. Will Smith plays an aspiring financial broker who is “broker than broke” but possesses an iron will to move from “I’d like” to “I am”. Will is not only herculean in his effort to live and become his dream, he sets an example to his kid that we should all set with our children. Protect your dreams and go after them. Don’t let anyone tell you that you can’t do something. When you have agreed this is your fate, it is YOU who is accepting you can’t do something and WON’T do it. If you haven’t seen the movie, watch it. It’s inspiring. Oh, if I had the magic pill or answers to how to make your dreams and goals happen, I’d be a wealthy woman. It comes down to sheer hard work, an iron will to see it through and putting yourself in a position to succeed. Some questions, though, that you can ask yourself. 1. Why do I want this? Is my motivation clear and pure? Am I doing this for the right reasons? 2. Am I prepared? Do I know what it takes to go from “I’d like” to “I am”? 3. Who am I putting in my camp to support me? Am I learning from the right people? 4. Do I want it bad enough? There have been times in my life and in my career that I wanted something so much I went after it and it meant that other things had to go: other people, their drama, and my own drama! And don’t kid yourself…change is so unpopular. It’s not because it’s not the right thing to do. It’s usually because you’re doing it and someone else is watching from the sidelines with no courage to do it themselves. People who change make themselves and the world better. They are remarkable, brave courageous, creative, original, and downright successful because they have doubled-down on the best stock they own: themselves. Good luck my friend. The world belongs to people who show up and work their asses off. Just keeping going. What are you doing today to make your goals happen? What’s holding you back? 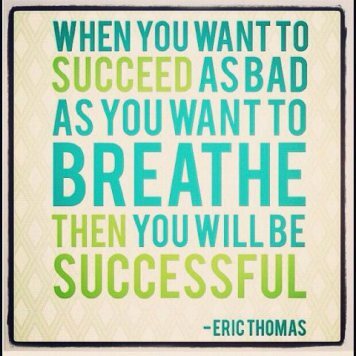 How bad do you want it? Sounds really positive Katie. How does this balance out with you failures, fumbles and unintentional alienation of others who feel dismissed or diminished the upness? Part of me feels quite inspired by, and pleased for, you but your positivity also stimulates other responses in me. I wonder if you can imagine what some of those are? Also wonder whether time involved in exploring those responses would seem to be a good use of your time or a waste? There’s also a large cultural difference at work here, particularly between US & Australia, but also Nordic & Asian cultures where very successful people, like your good self, would never express themselves in this way (so success has many pathways). Viva la Diiference! Keep up the good work – doing what you love is surely the most important !hing, however what interests me the most is what generates these differences in choice – is it more the individual or does the culture choose the individual form of expression ? What do you think? John, Thanks for taking the time to engage and put your thinking to words. Failures and fumbles are the best jewels of the learning. We don’t get to “success” without a ton of hard miles along the way. I openly share my own failures and fumbles so that others know it’s okay to fail. The real magic is in how we choose to learn and grow from them. As for how others are alienated or feel dismissed, there’s not much I can do here. That’s on them. I don’t own someone else’s feelings. I own mine and how I respond. Yes, I agree with you that culture does play a role, however I believe it’s one piece. Our life experiences and all the things below the iceberg play into how we see things in life and in particular success or failure. More here on the iceberg: http://www.brookgraham.com/WhatWeDo/Iceberg.aspx – good stuff. For me it boils down to individual choice. We choose to see things the way we see them. The more in tune we are to the iceberg and how it has shaped our choices, we can begin to understand how to make different choices. Nice piece katie. just what i need at this time. Personally i have chosen to learn from every failure (Not that i intend to fail at all) and build on every success however the greatest challenge has never been the opinions of others or a lack belief. The worst enemy has always been me and like you rightly pointed out conquering releases us to achieve all the things we dream of achieving in life. Our beliefs shape our thought process. even our attitudes stem from choices we make on a daily basis but those who would succeed (e.g me) failures, defeat and self are but stepping stones on the ladder of success and eventual greatness. David. Sometimes I have to go back and read what I write. Today I stumbled upon your comment. Thank you. I needed it! Have a fabulous holiday.